As this is the first Awfully Big Blog Adventure Review of October and as Halloween is just around the corner, are you in the mood for a deliciously ghoulish monster story? If so, read on. 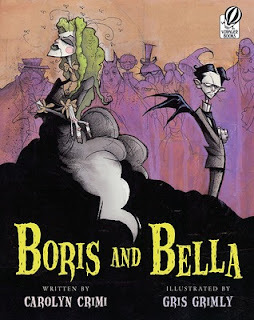 This time, I have chosen to review the picture book Boris and Bella by Carolyn Crimi. Set in the monster-inhabited town of Booville, we are introduced to two wonderfully incompatible neighbours. Bella Legrossi is so disgustingly messy — ‘her slime is the slimiest, her grime is the grimiest’ — that she has to live alone. Next door, Boris Kleanitoff is so persnickety — vacuuming his bats and dusting his cobwebs — that no one lives with him, either. The two polar opposites despise each other. They hurl insults. They delight in excluding each other from their monster shindigs. Both Bella and Boris plan rival parties, but to their horror, both sets of invitations are politely declined in favour of Harry Beastie’s Halloween bash. For the first time, the warring neighbours share something: a grudge against Harry. As ‘Halloween night soared in on bat wings’, Bella and Boris reluctantly attend his event. There are many ghoulish delights at the party: snake-spit stew, bobbing for eyeballs and a skeleton connecting his hipbones to his neckbone 'just for fun' to name a few. Much of the charm of this book is found in its wicked humour, word play and devilish details. Structurally, this book has a tight neatness that Boris would be proud of. The illustrations add much to the atmosphere of the story, too. Gris Grimly chooses a sepia colour palette and a quirky style reminiscent of Tim Burton’s Nightmare Before Christmas. The characters are expressive, the visuals are witty and humorous — the grill with sharp teeth at Bella’s bar-boo-cue, the unravelling mummy dancing the night away... We have a strong sense of the monsters' world. This story also has a big heart. As well as reading gory details and monster jokes, we watch uncompromising and objectionable characters soften, find common ground, and ultimately the basis for a new friendship. Learning to compromise and become tolerant is a special talent. I closed the book feeling satisfied and with a smile on my face.